At the Goldstar we have four categories of suites: Junior, Consul, Ambassador and Presidential. Each of our suites is features a fully-equipped kitchenette and wireless Internet. You can only access your suite with a key card and a safe has been installed in every suite. All our suites are perfect for both business trips and family holidays. The living room can easily be transformed into an office or an additional bedroom. The hotel is entirely non-smoking. The suite has a large double bed (180x200cm) and combines comfort and refined design. Spacious and nicely decorated, the suite contains a living area in addition to the bedroom. Soundproofed and air conditioned, the suite is composed of a bedroom and large living room (ideal for families). Very spacious and elegantly designed, the suite contains 2 bedrooms, 2 bathrooms and a large living room. Family offer - Ambassador suite 50 m2, breakfast buffet included, parking place included(vehicles maximum height 1.88 m)* according to the availabilities of the parking places. This special offer is for 2 adults and 2 children under 16 years old.For children more than 16 years old,we apply a supplement of 40€ per night(maximum 4 people in this type of suite) Free access to the swimming pool small fitness, sauna, solarium. Goldstar Resort et Suites is located just 200m away from the Promenade des Anglais and only 15mins by car from the airport. 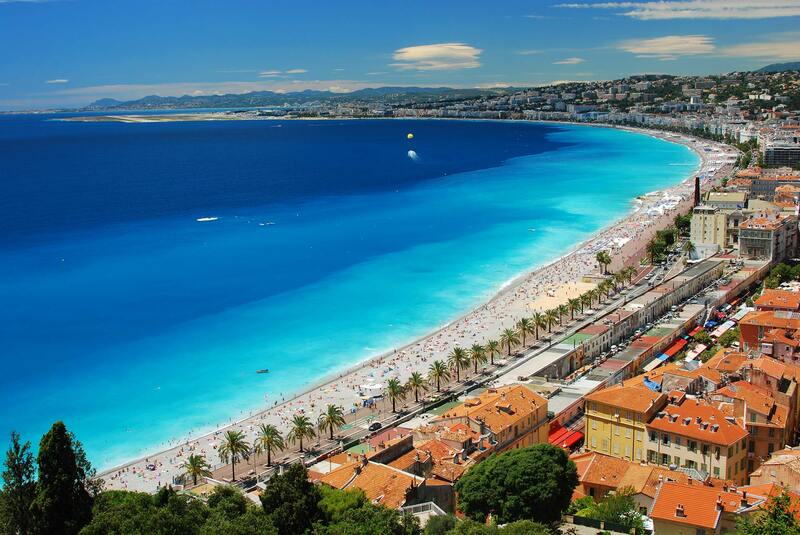 From your base at the Goldstar Hotel, you can discover Nice by walking just a few minutes to both the Old Town and the beach. All the 50 rooms at the Goldstar Resort & Suite are air-conditioned and soundproofed which means you are sure to enjoy a very relaxing stay with us. Unique on the Riviera, we can accommodate your family in one of our many suites which have all the comfort of a modern apartment. On the 7th floor, enjoy a drink while enjoying the the panoramic view of the city on our all-weather terrace. Our beautiful heated swimming pool is covered in the winter so you can enjoy all year around. The 7th floor is open between 9am to 7:00pm every day for you to enjoy a swim or just to soak in the view. We also have a sauna and dedicated hammam. Please make a reservation for the Sauna and hammam to avoid being disappointed. Enjoy a great start to your day in our sunny breakfast room on the 6th floor of Goldstar where we serve a buffet breakfast from 6:30am to 10:30am every day. Alternatively, enjoy a delicious continental breakfast in the comfort of your own room between 6:30am to 11am. Goldstar Resort et Suites has 4 levels of underground parking with 24h CCTV, accessible directly with lifts. Maximum car height: 1m88. To make your stay more enjoyable, all our suites are equipped with a free wireless . To organise meetings and professional seminars, Goldstar Resort & Suites provides 2 conference rooms able to hold from 10 to 40 people. Enfin une suite confortable, remarquablement insonorisée (sauf si vous ouvrez la fenêtre à l'heure de la sieste),très propre et où le personnel est accueillant et attentif à vos souhaits. Un vrai 4 étoiles avec piscine chauffée et solarium sur le toit à quelques encablures de la merveilleuse baie de anges...Que demander de plus d'autant que votre voiture sera gardée en sécurité en sous-sol ! Nous avons séjournéà à l'Hotel Goldstar Resort & Suites à l'occasion d'un un week-end en couple de 3 jours sur Nice. Nous sommes enchantés de notre séjour ! Dès notre arrivés, nous avons eu le plaisir d'apprendre que nous avions été surclassé ! (Réservation «Suite Junior», séjour «Suite Consul»). L'accueil, la gentillesse et la disponibilité des employés est très appréciable. La Suite était très propre, la literie : un bonheur ! La piscine avec transat sur le toit est géniale quand il fait beau. La situation de l'hôtel est impeccable quand on veux profiter du bord de mer, du centre ville pour le shopping et du vieux Nice. C'est avec un immense plaisir que nous retournerons séjourner à l'hôtel Goldstar Resort si l'occasion se représente. My family stayed at the Goldstar for 4 nights. Great location quieter then old town. Very spacious rooms. Helpful staff. When I arrived I needed help with a tour I had booked and they called and made sure everything was set up correctly. Easy to get to places by walking. Only a couple of blocks from the promenade. Walking distance to great restaurants. Stayed there in the end of April for three nights. Very helpful staff. Nice and friendly. I could change my room and I am very thankful for that. First room was noisy as next to traffic. Overall great room. Very clean. Big bathroom and nice kitchen corner. Did not need public transport during the stay as the hotel is close to sea and the centre but otherwise the bus stop is just some metres from the hotel. Carrefour express is also very close. Enjoyed the pool and sauna. This hotel is well located about 5min walk from the old town and just few blocks away from the beach. The hotel offers good value for money during the off season period. Junior suites are spacious and big bathtub was a nice surprise. PARKING: If you rent a car you can park it by the street free of charge daily from 20.00 to 09.00 o'clock. During the daytime maximun parking time is 2 hours which costs about 2,60 €. So, you might not need parking garage service the hotel offers for 25 € if you are using your car at day time. Local bus comes from the airport closest to this hotel. If you use it leave the bus at Congress bus stop. Breakfast of the hotel was a bit dissapointing since there was no fresh vegetables such as tomatoes or cucumbers awailable. Otherwise it was okay. At the 7th floor there is a sun terrace and small pool which was not that appeling. There was no shower to use by the poolside which may have some impact on the freshness of the water. There were also two days when we noticed shortage of a warm water in the morning time in rooms. Stayed here for 3 nights and was suitably impressed. Large suite with kitchen, separate living area with table and sofa (converts into a double bed),huge bathroom and large bedroom with plenty of wardrobe space! Perfectly located just a few streets back from the Promenade and a few minutes from the pedestrianised area. 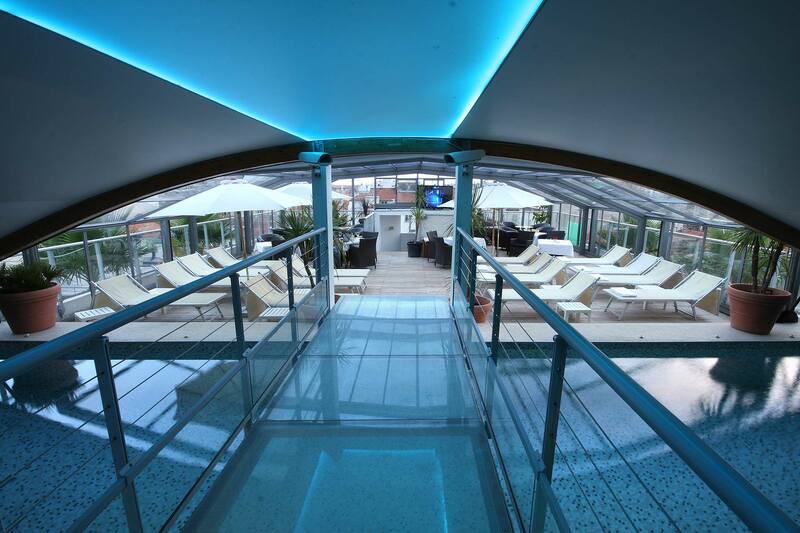 Lovely rooftop area and pool with gym equipment,if slightly on the small side. We had breakfast included and it was really good, nice selection of continental and hot options. Breads and pastries typically delicious. Overall a fantastic break. Would heartily recommend! Splendido ! !Basta poco per innamorarsene.. Un weekend perfetto! Posto molto chic elegante e classico, curato in tutti i dettagli, l'hotel offre di tutti i servizi disponibili per soggiornare, l'unica cosa (gli ombrelli forse non a sufficienza) tra sauna, hammam e piscina coperta c'è l'imbarazzo della scelta, per non parlare poi del meraviglioso bagno delle suite !! Nulla da dire, ci hanno accolto molto bene e soprattutto i complimenti alla receptionist Stephanie, grazie di tutto! A presto! Tre giorni da sogno !! !Bellissima mini vacanza in questo ottimo hotel , stanza favolosa, avevamo prenotato una suite junior e ci hanno accolto invece allo stesso prezzo in una suite Condor, più spaziosa è più bella ovviamente, l'hotel è' vicino al mare , noi abbiamo portato il necessario per cucinare in suite, comoda la zona fai da te con i fornelli a induzione, lavastoviglie, letto e vasca da bagno spaziali, camera e hotel pulitissimi con la camera che era insonorizzata. Siamo poi andati al settimo piano con la piscina riscaldata 29 gradi, (molto pulita), siamo poi anche andati due volte in sauna e in hamman ( che bisogna solo prenotare) tutto pulitissimo e ben curato. Complimenti grossi alla receptionist stephanie, professionale e gentilissima, ci ha consigliato anche dei locali dove passare la serata del martedì. Ci ritornerei comunque subito, grazie di tutto. Al termine dei nostri due giorni la promessa è di ritornarci al più presto! le suite sono veramente molto funzionali e accoglienti, pulitissime e attrezzate anche per un pasto veloce per godersi tutto il clima di Nizza. La comodità del garage sotterraneo fa dimenticare il problema della macchina da parcheggiare. Alla fine ottimo rapporto qualità/prezzo grazie ad una colazione superabbondante e ricca di ogni sfizio dolce e salato. Мы с дочкой были в Ницце впервые. Мы приехали из Стокгольма. Нам очень понравился отель! Нас тепло встретили, и номер оказался выше наших ожиданий. В номере было все, чтобы почувствовать себя комфортно. Роскошные аппартаменты с большой ванной, уютные комнаты и замечательная небольшая кухня. В номере всегда было чисто (отличное качество уборки). Отель расположен очень удобно. Хотелось бы выразить особую благодарность Наталии, которая с высоким уровнем профессионализма помогла нам со всей необходимой информацией. Мы обязательно остановимся в этом отеле во время следующего визита в Ниццу. От аэропорта Ниццы "Cote D^Azur" до отеля можно доехать за 6 евро на автобусе № 098. А от ж./д вокзала "Gare de Nice-Ville" дойти пешком за 20 мин. Очень удобное расположение отеля. Вблизи находятся: музей Массена; отель Le Negresco; русская православная церковь. До английской набережной и моря - 5 мин. по улице Meyerbeer. На этой же улице находятся два ресторана : " 11Е ART" ( c изысканной французской кухней) и Le Barracuda " д..2, где можно очень вкусно и недорого пообедать и поужинать. До Старого города 30 мин. пешком. У нас был прекрасный номер "Ambassador " на 2-ом этаже с видом на внутренний зеленый дворик(2-комнаты,небольшая кухня с плитой, п/м машиной, м/в печью и холод-ом;( вся необходимая посуда есть). просторная ванная комната. Очень удобный номер, для семей с детишками. Завтраки в отеле без особого изыска, стандартные континентальные. Обслуживающий персонал очень доброжелательный и отзывчивый. Попросили в номере заменить электрочайник, нам принесли в пользование совершенно новый чайник. Огромное спасибо Наталье и Юлии за отзывчивость, внимание и помощь в организации экскурсий. Удачи Вам во всем!!! Обязательно приедем к Вам еще раз! The Goldstar Resort Nice is located in the heart of a very chic district -le quartier des Musiciens - a few meters away from the Negresco hotel, 200m away from the sea front and 250m away from the pedestrian areas and the shops. You can also walk to Nice’s Old Town where you can enjoy fresh fruit and vegetables markets, winding narrow streets and fabulous ice cream. You’ll be able to enjoy its museums, theatres and opera. To improve the quality of our services, please get in touch to explain us your specific requests so we can do all that is possible to ensure you have a wonderful stay in our hotel.